Every parent’s first responsibility is making sure that their children are happy and healthy. But a close second, especially in today’s interconnected, global world and economy, is ensuring that your child has the skills and knowledge that they will need to do well academically and, eventually, in their career. Because of the prevalence of technology in modern society, when it comes to academics, the STEM subjects—science, technology, engineering, math—will have a tremendous impact on our children as they age. As such, it has never been more important for parents to begin introducing their children to STEM, often at earlier and earlier ages. Luckily, there are many ways that you can achieve this goal. Below, we discuss some of the easiest ways that parents can help their children learn about STEM at home. Whether your child is preschool-aged and completely educated at home or they are enrolled in an early childhood education program, kindergarten, or elementary school, this advice can help you get your child’s STEM education off to a good start—all in the comfort of your home. One reason that parents sometimes struggle with exposing their children to STEM is the fact that they aren’t sure that they are qualified enough to lead a conversation about science, technology, and math. After all, you’re a parent, not a teacher who has been trained in the best ways to teach these subjects to young children! The good news is that when children are young, lessons do not need to be highly structured. In fact, young children often do best when they are simply allowed to explore independently. Encouraging your child to explore the world around them, ask questions, and be curious and creative is, perhaps, the single most important way that parents can help their children develop the experimental mindset that they will later need in their STEM education. 2. Take advantage of the many STEM resources available. As children grow beyond the infant stage and into the toddler stage, parents will likely find themselves needing a bit more structure as they introduce their children to STEM. There are countless resources that parents can turn to in order to bring STEM into the home to help their child start learning these important skills and concepts. From online websites and blogs with great ideas for hands-on STEM projects to educational toys and kits that make learning fun, it’s easier than ever for parents to enable their children to get a head start with STEM. 3. Plan STEM-focused vacations and family trips. Introducing your child to STEM doesn’t need to be limited to the four walls of your home. There are countless opportunities that you can use to use expose your child to STEM while also making the experience a fun and impactful one. For example: When it comes time to plan family vacations and trips, weekend activities, or even birthday extravaganzas, turn to educational options like museums, zoos, your local arboretum, or hands-on museums and science centers. Frequenting these venues will allow you to expose your child to concepts that might otherwise be difficult to do at home, all while making for fun moments and memories. 4. Create a makerspace at home. A makerspace is essentially a workshop of sorts that typically houses various kinds of tools, materials, and technologies that are needed to complete a project or make something. Parents often learn about them during the school search process, as some schools will have makerspaces and/or a maker education program to supplement more traditional classroom learning. But makerspaces don’t need to be limited to a classroom or library setting. With a little ingenuity, parents can create a makerspace right in their own home that their child can use to flex their creative muscles and learn in a hands-on environment. Don’t have the wiggle room in your budget for a 3D printer, laser cutter, or other high-tech gadgets? You don’t need them. When they are young, children don’t need advanced tech in order to learn about STEM. Simple items like jars, measuring cups, markers, cardboard, baking soda, and vinegar, etc. will do perfectly fine, and really is all that most parents will need to complete some simple and fun—but, nonetheless, educational—STEM projects at home. 5. Find a preschool and elementary school that embraces Maker Education. For many parents, whether due to work or other obligations, it isn’t possible for them to keep their young children at home. These parents will typically enroll their young children in a nursery or preschool program prior to kindergarten. 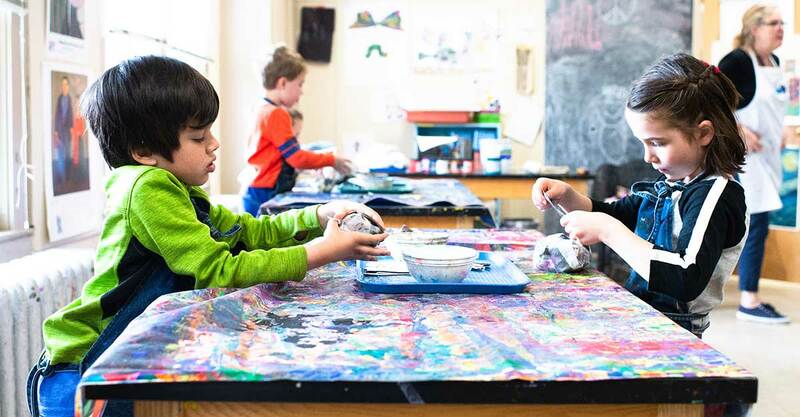 For parents who prioritize STEM, it might make sense to keep an eye out for preschool and elementary school programs that embrace Maker Education, which places a heavy emphasis on hands-on, interdisciplinary learning. STEM has never been more important to our children than it is today, and it is only going to become even more essential as time goes on. By bringing the principles of STEM into the home and exposing children to them as early as possible, parents will be able to begin laying a foundation that their children will need throughout the rest of their lives. The suggestions above are just some of the steps that parents can take to achieve this.